My mom used to always make monkey bread for special occasions and since I can’t resist a good pun, it seemed fitting to pull out this caramel sticky bun recipe to announce my own little “bun in the oven”! The hubs and I are expecting our first baby in August and we couldn’t be more excited. 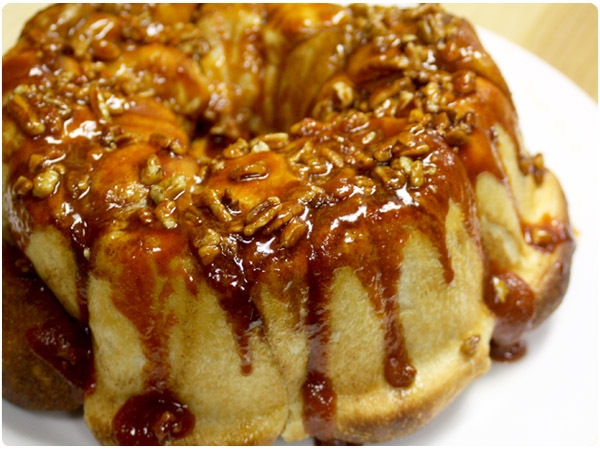 But back to the monkey bread…if you have any affection for sticky rolls, you must try this. With just a little pre-planning (it needs to sit overnight) it’s a delicious and impressive pull-apart breakfast “bun” that only takes minutes of your time to prep. Lightly butter a bundt pan. Sprinkle pecans in the bottom of the bundt pan. Sprinkle pudding mix on top. Place frozen dinner rolls evenly into the pan. 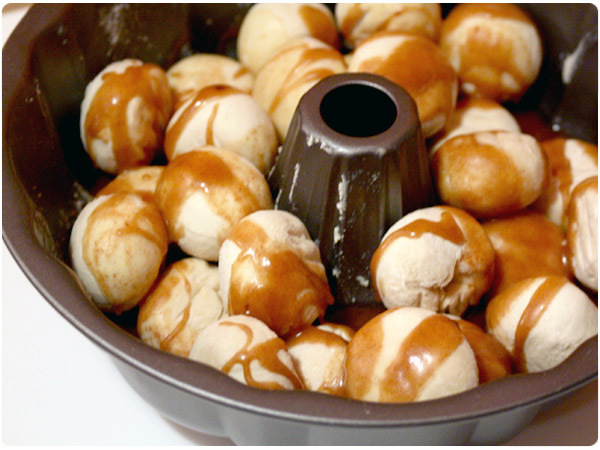 In a large glass measuring cup or small bowl, microwave butter and brown sugar until melted. Whisk in cinnamon and vanilla until mixture is smooth, then pour over dinner rolls. 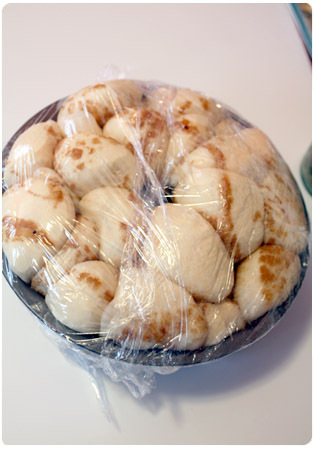 Wrap pan with plastic wrap and set on the counter overnight to allow rolls to rise. Remove plastic wrap and bake at 350 for 25-30 minutes. Yayyyyyy! So excited for you guys! Congratulations! Congratulations on your babe! So exciting and I love your post title. My mom made monkey bread this weekend, only she wrapped each little dough ball around a small chunk of cream cheese and tucked apples (cooked in sugar, butter and lemon juice) in between the dough balls. It was delicious! Emily, that sounds so good! I’ve never tried doing it that way but anything is better stuffed! Will definitely be testing that out. How wonderful!! A thousand congrats! Congratulations!!! Being a mommy is the best thing in the world. =-) And this recipe sounds super delish. Can’t wait to try it. Katie, I know I’ve said it once already (probably twice) but I can’t help but congratulate you again on your wonderful news 🙂 We’re thrilled and will eagerly anticipate your undoubtedly stellar nursery plans! So, so excited for you!! Congratulations!! And, I have a quick question: What type of frozen dinner rolls did you use? The ones I know about are much bigger (pre-cooked but just need to be re-heated). My boys would love this recipe and it would be great to surprise them with it this weekend! @Kate – I used these Rhodes white dinner rolls which I find in the frozen bread section at my grocery store. Hope you can find them! Awwwww yeaaaah! I love Monkey Bread! I make it about once a year, usually using a different recipe every time. Going to definitely be using this recipe. Thank you!